Logan is a relentless and thrilling film, a film that takes things farther than you may imagine, writes Raja Sen.
Wolverine was always a cowboy. Sitting at the saloon bar downing a whiskey while waiting for trouble to find him, the sideburned superhero has always been better suited for a stetson than his friends. He’s lonesome, laconic and never, ever wants to talk about it. In the Wild West, there are those with loaded guns and those who dig, and god have mercy on the poor fools who carry a gun to this man’s knife-fight. Except -- as we see in Logan -- he isn’t the wolf he once was. He’s coughing like he’s being devoured from the inside. He has a grizzly Mel Gibson beard, and his self-healing body, while still intimidatingly proportioned, looks like a cruelly abused muscle car, all lumpen and grotesque. He wearily drives limousinefuls of bachelorettes around town to make a living, and when he gets out of the car, he limps. As you may have gathered, this is not a superhero movie in its traditional sense. Closer to a mash of Mad Max: Fury Road and Unforgiven than to any template-following cape-and-leotard flick, Logan is an emphatically cheerless film about the cost of life, and the burden of being a superhero in a world that doesn’t deserve them. Which is why when Wolverine’s claws rip through someone’s face, this time you see the horror vividly: bone and flesh and skin tearing apart to make way for adamantium blades shearing through human cheeks. James Mangold, director of the compelling 3:10 To Yuma, is well suited to this refreshingly self-contained Western, one that lays myths to rest without feeling the need to reference other movies. You don’t need to have read a single X-Men comic to watch and appreciate Logan. Hugh Jackman was cast in the role 17 years ago and rightly jeered at for being far too tall for the character. Ever since then, he’s been sullenly and stoically trying to shrug off the predictability of the superhero movie. In his last outing with Mangold, the two made The Wolverine, a sparse and minimal action film that was impressive in its unconventionality but often painfully dull, but this time they have finally created something truly unshackled by genre expectations. Bless ‘em. If we must be served a superhero movie every three months, may it at least not be made in a mould. 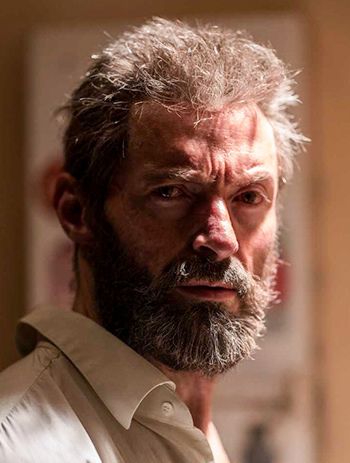 Jackman wears pain, persecution and baggage in his eyes, and in his sighs. We see him wanting to stamp out hope but unable to go through with it, the actor carving up his character with both weariness and restlessness at once. It is a strong, resonant performance, an appropriately powerful snikt-swansong. By his side is the great Patrick Stewart, who gives the most emotionally affecting performance of the entire X-Men franchise as a decrepit, mentally weakened Professor Charles Xavier. He’s older -- 'I'm a nonagenarian,' he corrects punks who think he’s in his 80s -- and needs Logan’s help to be taken to a bathroom stall. Heartbreaking as it is to see Xavier infirm, the condition has steered his character away from the sterility of complete control, and lent him a childish likability. My top moment from Logan might well be the sight of Charles excitedly unpacking a fedora. This isn’t a two man film, however. It is also about a young girl, an absolute showstopper of a child who has all of Logan’s powers and more, and none of the restraint its taken him lifetimes to accumulate. She’s played by incandescent newcomer Dafne Keen, and the way this young child relishes the violence -- slicing villains to shreds with wildcat rage and ice-cream-truck glee -- may be this film’s most disturbing image. That, or the fact that after a car window next to her is shot at, she spits out a chunk of glass as if it were a watermelon seed. Mangold clearly believes in the texture of violence. It is a relentless and thrilling film, a film that takes things farther than you may imagine. I was convinced a particularly brutal sequence would turn out to be a character’s nightmare but it turned out to be bloody real. It’s been a while since stakes felt so genuine in a film about mutants. One of the things that has always struck me about the X-Men series -- unlike the films coming out of the all-powerful Marvel Cinematic Universe -- is the way they insist on casting the most unlikely villains. This film has Richard E Grant as the principal baddie, and the last few X-movies have featured Oscar Isaac, Peter Dinklage and Kevin Bacon in those parts. These are far from traditional supervillain picks. As the curtain falls on Logan and we recognise it as a bleak parable about America, one thing to know is that the bad guy happens to be named Donald.